Sometimes this is needed to be able to communicate the way, when no one can notice that. A specialty audio security headset is required with something micro size hidden inside ear. There is such a gadget! It functions the very same principle as a usual Bluetooth headset for a mobile phone, but nothing is near your ear and no wires are coming to the ear. The core of this wireless audio security technology is a passive magnetic vibration principle earpiece that hides inside ear canal completely with almost a double spare, unit size is as small as 0.24 inch (6 mm) in diameter and 0.35 inch (9 mm) long. Do not trust other sellers offering less size units: such units either do not exist, or are in fact larger, or are very low audio power. 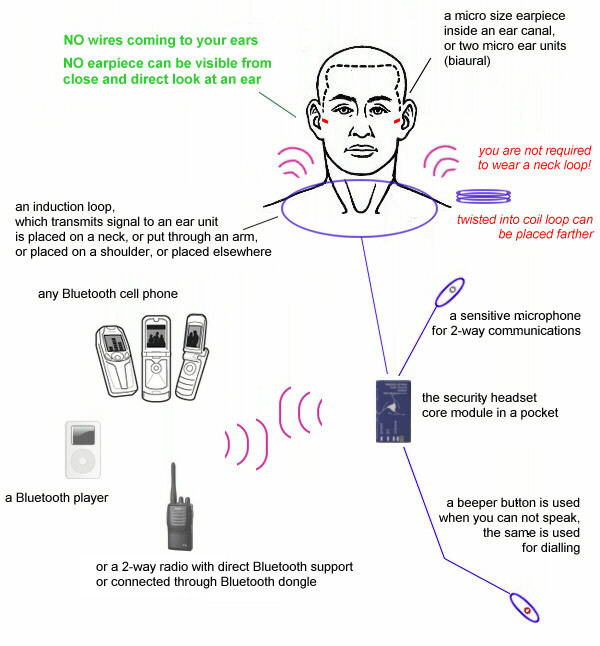 Nobody can notice you have any ear piece watching directly at your ear from a close distance. Nobody can ever hear any sound produced by the ear piece from an outside. This headset is NOT a special equipment according to US federal laws. Most of countries regulations prohibit the equipment intended for covert obtaining of an information owned by a 3rd party. Instead, this headset connects to your personal phone only, transmits/receives the information owned by you and openly directed to you. It does not require any license to purchase, own or use it. 6) a Bluetooth cell phone, player, walkie-talkie or whatever somewhere near. What are its advantages over competitive magnetic ear units? - a high capacitance rechargeable li-pol battery on board: power is enough for several hours (not a few, but several hours) of speaking application; no need in any external sources of power like 9V batteries, or whatever. What are its advantages over competitive active (battery powered) ear units? - a lower self cost (but still a very quality product) makes it more attractive to resellers. - built-in rechargeable battery is balanced and overcurrent protected. We are manufacturers of this product (original OEM). S&L Works LLC, registered and based in Pennsylvania, USA. Shipments originate from USA warehouse. We process both retail (small quantity) and wholesale orders. We can offer the lowest possible prices for resellers. Please refer to Device Details to understand it better.